Location is everything! This 5.23 acreage is close to Parker, all paved roads to the home as well as asphalt driveway. Wonderful mountain views! This home has a WIDE open floor plan, wonderful for entertaining with it's very large kitchen and adjoining family room. 5 bedrooms, 3 bathrooms. Lots of storage. Inside shop area adjacent to the laundry room. Decks on both sides of this home for sunsets and sunrises! Brand new roof, new kitchen refrigerator, microwave, new stove and oven hood, and new kitchen sink! New exterior paint on home and barn, new stain on deck. Furnace new in 2015, central air in 2016, the well has been adjudicated, school bus stop is close. This home has all the big ticket items taken care of for you! 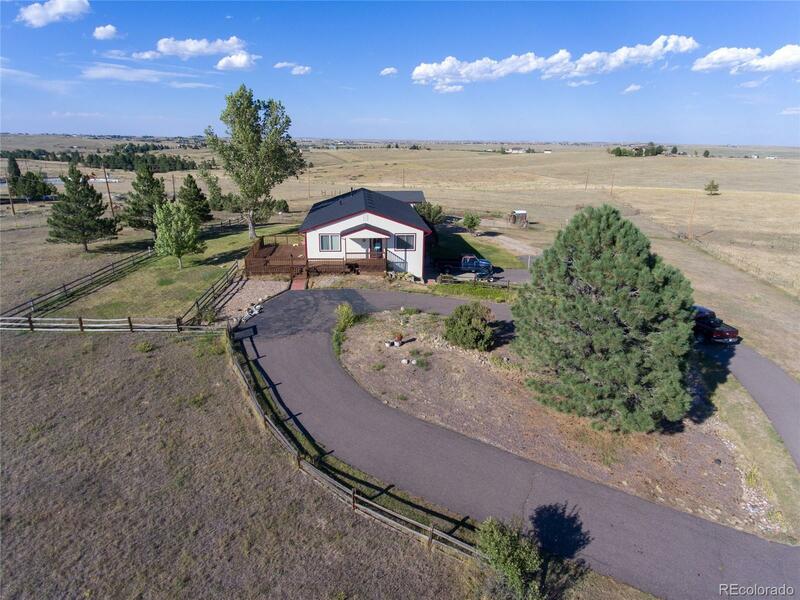 Barn is set up for horses, also has a tack room, 3 pastures for rotating, and there is open space throughout the subdivision for you to ride on (not just narrow bridle paths), a horse lovers dream! See the picture map. Seller offering $3000 in concessions for carpet.